National Board of Review: Top Ten Independent Films; Venice Film Festival, Best Actor (Charley Plummer); Les Arcs European Film Festival: Best Actor, Best Cinematography, Best Original Score; Best Adapted Screenplay. Four other wins, 15 nominations. 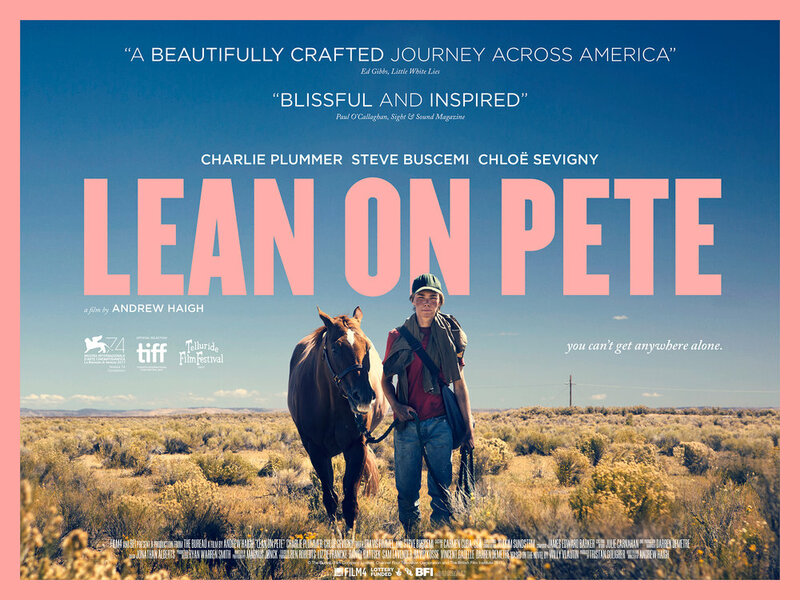 “Lean on Pete” is a movie about a boy, a horse and the challenges that befall them, which may imply that the viewer is entering Tearjerker Central. However, British writer-director Andrew Haigh (“Weekend,” “45 Years”) avoids sentiment. Sobs are earned the hard way in this moving drama, which grips the viewer with scrappy humour, grit and grace. Charlie Plummer (“All the Money in the World”) stars as Charley, a motherless boy who lives in Portland, Oregon, with his jobless father, Ray (Travis Fimmel). The well-meaning n’er-do-well dad is also soon out of the picture, so the teen scrapes by working for Del (Steve Buscemi), a local horse trainer. It’s there that Charley develops a bond with Lean on Pete, a five-year-old horse about to outlive his usefulness. For Del and jockey Chloë Sevigny the animal is future dog food, nothing more. But to Charley, Pete is a kindred spirit. Eventually, the lad has no choice but to hit the road, walking with Pete (he never rides) toward some vague vision of the future with a distant relative. Reality intrudes. But all is not lost. Working Willy Vlautin’s novel, director Haigh shows a poet’s eye for landscape. Charley meets many people on his journey, affecting him in ways too moving to spoil. Anchored by Plummer’s extraordinary performance, the hypnotic and haunting “Lean on Pete” works miracles in miniature, painting a portrait of a marginalized America that cuts deep.